Penelope's birthday was on Friday and she wanted to go to some parks. 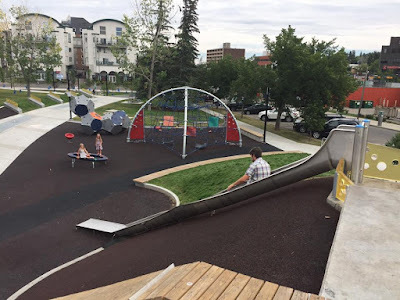 The first one we went to was Thomson Family Park located in the beltline at 1236 16 Ave SW. There is parking along both sides of the park which is great especially if you are driving from suburbia like we do. 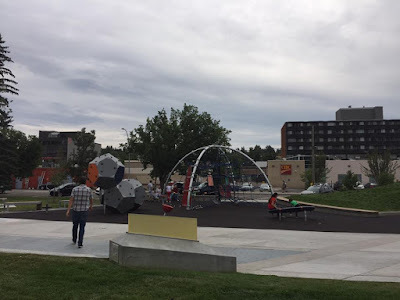 This park used to be the home of the Calgary Lawn Bowling Club and you can still see where some of their fields used to be. This park is listed on Calgary's Inventory of Historic Resources. 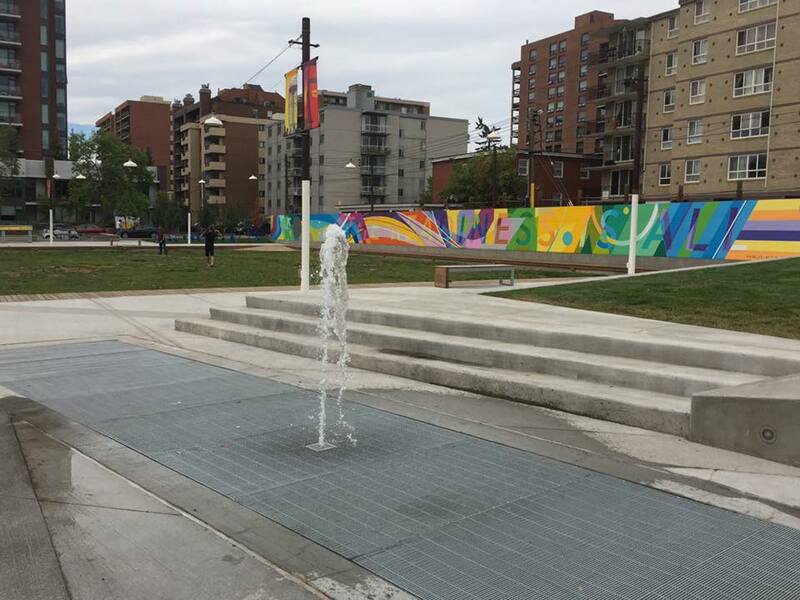 This park is relatively brand new with the grand opening being held last October. 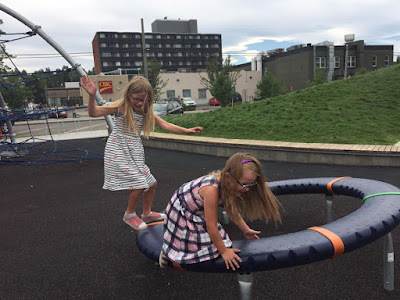 When I first saw the slide and saw that it was middle, I was a little concerned that it would be too hot for the girls but it didn't appear to be although there wasn't much sunshine at the time but it was still very warm and humid outside. At the top of the slide, which you access by the stairs on the right hand side, is a large deck like area that allows you to see a view of the entire park from above. Penelope love the rock climbing rocks. 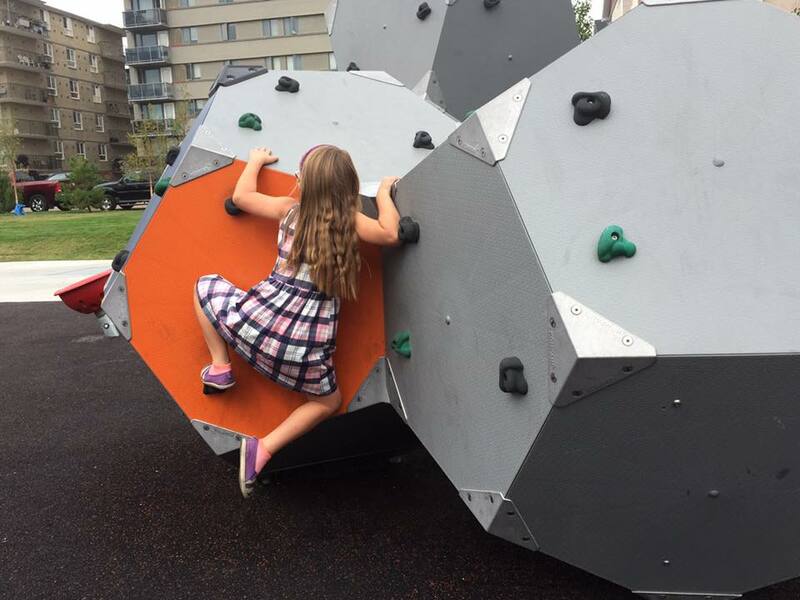 It took her a few tries to get to the top but once she was able to figure it out she would try other angles and sides. Her athletic ability never fails to amaze me. No idea where she got it from. 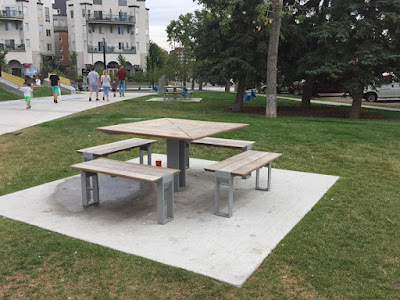 They have picnic tables scattered throughout the park and there are also benches surrounding the far end of the playground structure for parents to sit on or kids to have a break. 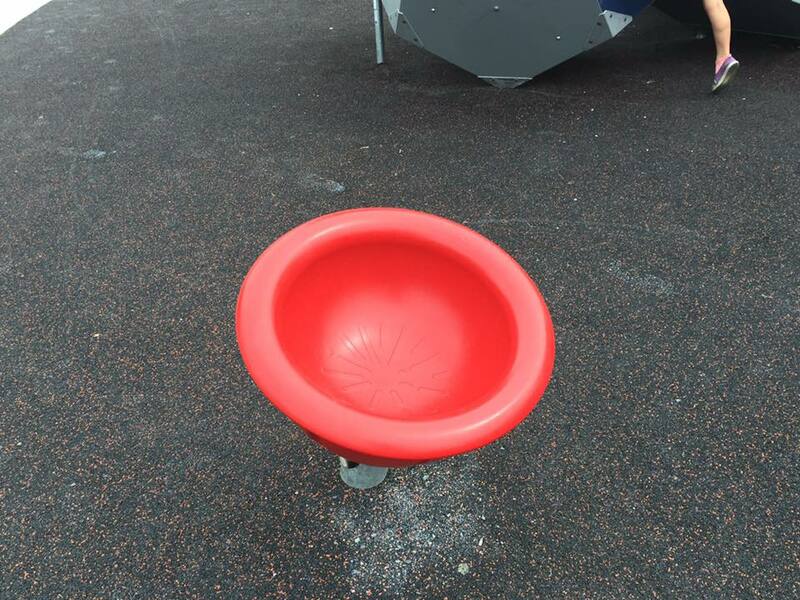 Nellie Breen Park in Inglewood which is one of my absolute favourite parks has this red swingy chair thing. I have no idea what the official name of it is called but I hate it so much but at the same time I have to try it out anytime I see one. The public school in Somerset might also have one but I can't remember for sure. It doesn't take much to get going on this but it is very difficult to stop it and get yourself out. At least it is for me. Greg ignored me when I asked him to help me out - thankfully Finley was willing to help me. It has some sprinkler type things on one side of the park. They are allowed to be used for running through like a spray park but it is recommended you not drink the water or use them unsupervised like all other parks as far as I know haha. Next time we come, I must remember to bring the girls' swimsuits so they can run through here. 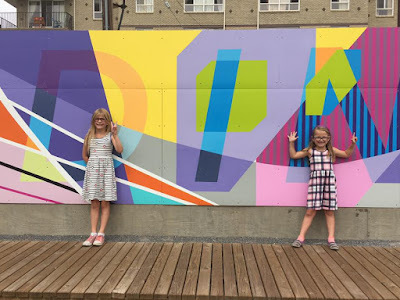 I love this wall and the incorporation of public art in playgrounds and other areas around the city. I know this is a touchy subject for most but I really enjoy the program and the art. This mural continues the theme of bringing people together in an outdoor environment and engages our future generation through Public Art's Street Art Program for Youth. 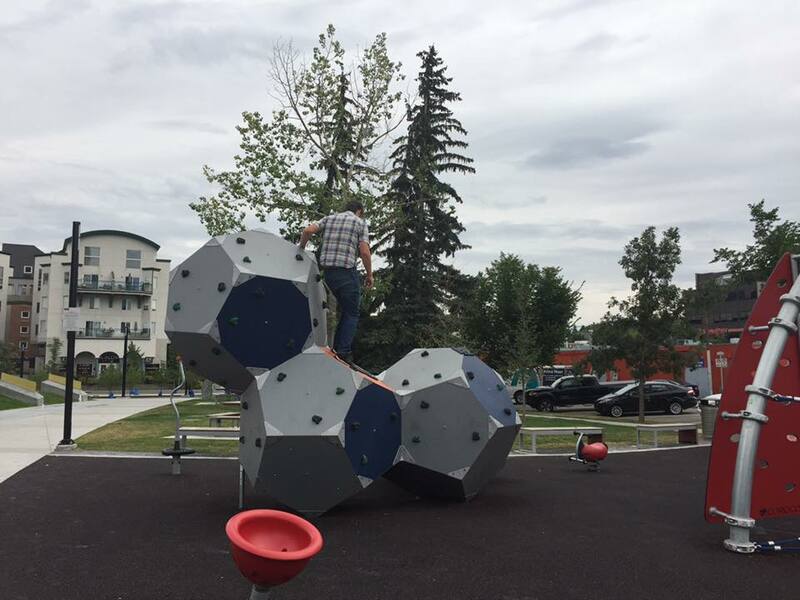 This park creates a strong sense of community with laughter, adventures, community events, special occasions and enjoying nature. (City of Calgary Website). 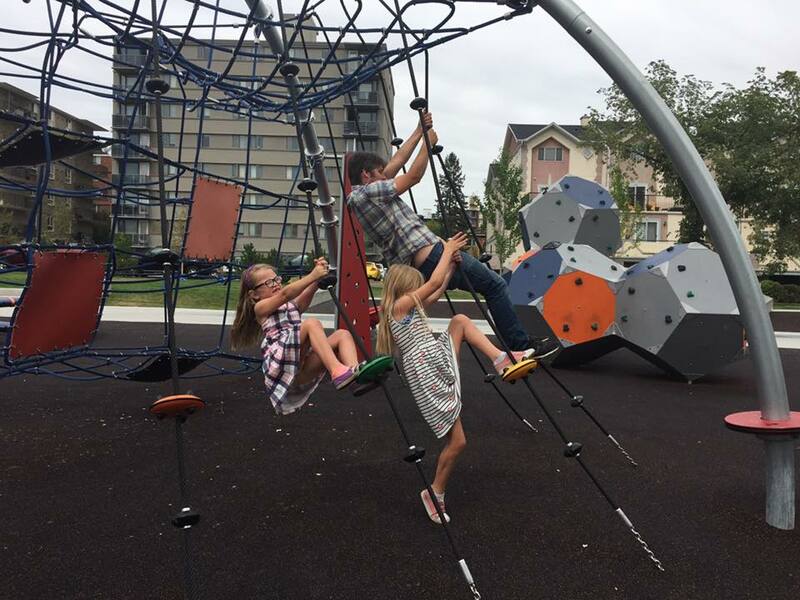 The climbing rope apparatus was a huge hit with both Greg and the girls. I didn't attempt it as it looked challenging and I am not the most co-ordinated person around haha. Greg did say it was harder then it looked but you guessed it - Penelope didn't have much problem with it. This photo was taken from my viewpoint which was on top of the slide deck area. It's not a huge park by any means but it kept the kids busy for quite awhile. 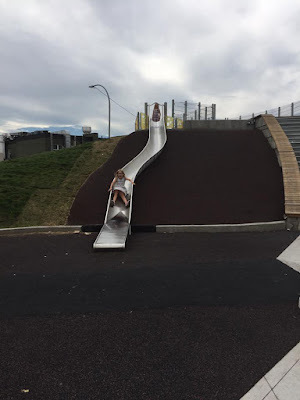 I did go down the slide and it wasn't hot and it is very fast which the girls really liked. I like it because there is no sand or rocks which I hate with a passion. Greg giving the rock climbing rocks a try. This thing was really cool it was kinda like a manual treadmill but it was on a circle. You stand on the circle and you and any other humans on the wheel with you walk in the same direction and it moves. We didn't know that until Greg told us. To be honest, I am not sure we would have figured it out properly without him telling us. 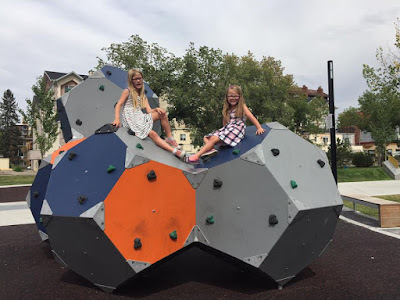 The girls loved this so much. Greg liked it more when the girls weren't with him because I think he thought they were gonna hurt him. Just before we left the park and headed to the next one on the list. I love this playground for many reasons but the number one reason I love it is because it is geared towards older kids. Yes, younger kids can easily try all the apparatuses with their parents help but so many parks don't work for Finley because she is so tall and getting older. We loved this park and we will absolutely be back again. Go check it out if you like to explore outside your community and/or quadrant or if you find yourself downtown with some time to kill. I promise you won't be disappointed. 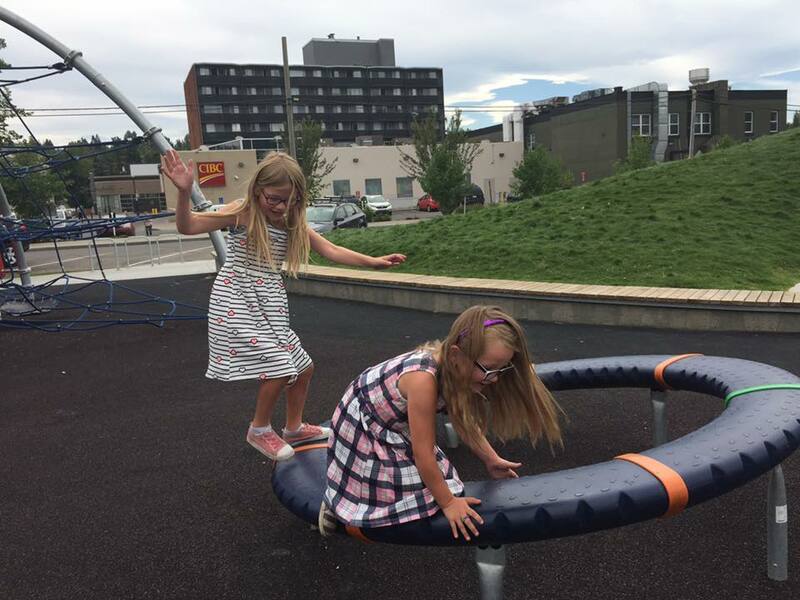 That rotating wheel is my favorite thing to play on at the park!